Tourists flying to the UK this summer appear so far to be relatively undaunted by recent terror attacks, according to the latest research. Statistics from ForwardKeys, which predicts future travel patterns by analysing 16 million booking transactions a day, show demand for the UK is holding up well. The latest data shows that, as of 17 June, forward bookings for international arrivals in London for the months of July and August are currently 12 per cent ahead of what they were at the same point last year. This is a significantly more positive position than the European average, which is currently 7.8 per cent ahead. 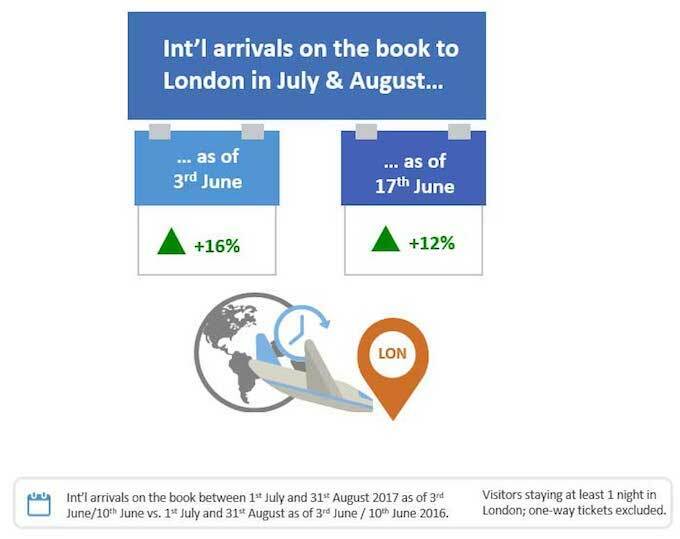 The positive outlook for travel to London in July and August could fall or rise in the weeks ahead, but so far it has held up well since the London Bridge attack, as prior to the attack, bookings for July and August were 16 per cent ahead. ForwardKeys research also found that after the London Bridge attack, there was no significant wave of cancellations for air travel to the UK; although there has been a slow-down in new bookings. Looking at arrivals from the beginning of June and forward to bookings for the rest of June, ForwardKeys’ latest assessment is that June will still show double-digit growth on last year, 11 per cent ahead. 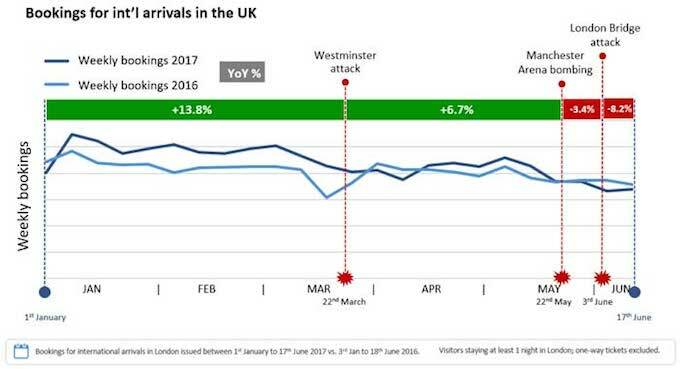 Looking back, bookings for international travel to London (which accounts for around 85 per cent of the UK as a destination) had surged up 16.5 per cent on last year prior to the Westminster attack on 22 March. 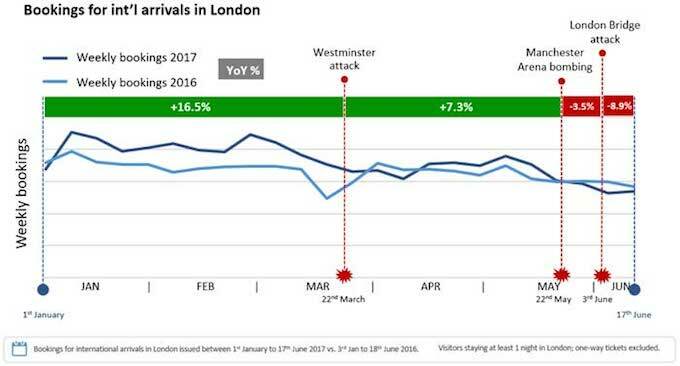 That strong surge abated somewhat after the Westminster incident, as the surge in bookings slowed to a very respectable +7.3 per cent up on the previous year. After the Manchester bombing on 22 May, enthusiasm for the UK appeared to wane further as the rate of bookings for London fell slightly, down 3.5 per cent on last year. The stall in bookings immediately after London Bridge needs to be treated with caution because it can also be explained by two other factors – 5 June was a national holiday (Whit Monday) in most major European countries, when fewer people book flights (that holiday fell a week earlier in 2016); and the dramatic impact of the Qatar travel blockade kicked in with a mass wave of cancellations by those flying through Doha on their way to the UK. Looking at the UK as a whole, rather than just London, the figures reflect a near-identical trend. Commenting on the data, Olivier Jager, CEO, ForwardKeys, said: “One needs to bear in mind that even though we have seen something of a slowdown in bookings for the UK in recent weeks, the forward booking situation for July and August remains extremely healthy and there has been a sustained positive trend in bookings for the UK throughout the year.